According to Business Traveller magazine, Nigerian carrier Arik Air will launch its flights from London to Lagos on December 15, using the Airbus A340-500 aircraft with their plush interiors and seating designed for Kingfisher Airlines. Arik recently took delivery of its first of three A340-500 aircraft, planes originally destined for Kingfisher Airlines before it was forced to shelve the order. 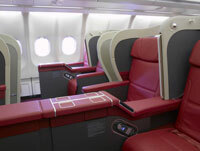 A look at the pictures on Arik’s website shows that the carrier will be using the same fully-flat seating product originally intended for Kingfisher, as well as the communal bar for premium passengers. It is known that the A340-500’s were to be Kingfisher’s flagship flights. 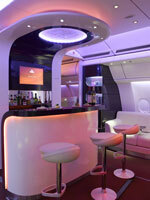 Dr. Vijay Mallya and his team, reportedly spent massive time and effort designing the interiors. The benefit will be reaped by Arik. Without doubt, it’s a coup for Arik, in it’s head-to-head battle with British Airways and Virgin Nigeria on the route. There will be 201 economy seats in a 2-4-2 layout, and 36 Premier seats in a 2-2-2 configuration. The Kingfisher product, came with a full basket of goodies; fully-flat beds with vibrating massage functions and lumbar support, touchscreen controls on the armrest, an in-flight entertainment system with 17-inch (43cm) screen and remote in the side of the seat, mirrored privacy screen, in-seat power and USB connectors, personal reading light, and mood lighting. Kingfisher also featured a communal bar area with white leather sofas on each side and a bar in the middle with three stools. As a admirer and supporter of Kingfisher Airlines, I really feel for the team. Cheer up gang, the economy will recover. 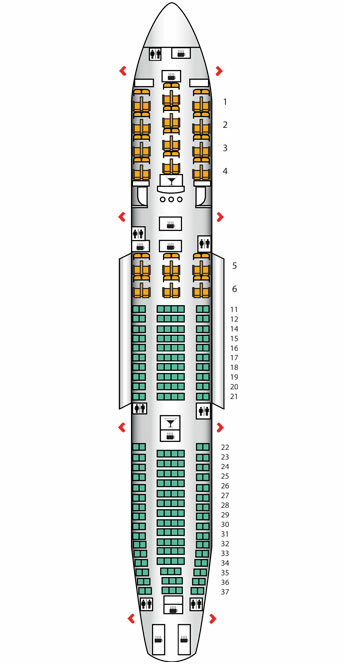 Kingfisher (Arik Air) A340-500 seating plan. Image (c) Business Traveller. Next Kingfisher A320 planes de-registered or returned ?